What is a renal stone? A urinary stone or calculus is a crystalline mass that forms in the collecting system of the kidney. It is formed when the concentration of solutes in the urine become elevated enough to allow crystal formation. At presentation the stone may be in the collecting system of the kidney (pelvis or calyx), or in the ureter between the kidney and the bladder. 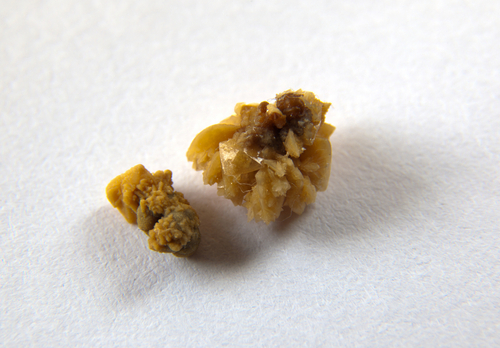 Kidney stones may contain various combinations of minerals. The most common type of stone contains calcium in combination with either oxalate or phosphate. Other rarer minerals include uric acid and cystine. Why are renal stones formed? Several factors influence the likelihood of stone formation. Normally, urine contains inhibitors, which prevent crystals from forming. However, in situations where the solute concentration exceeds these limiting factors / inhibitors, crystal formation occurs. There also is a genetic element to stone formation, with some people more prone to kidney stone formation than others. How do patients with renal / ureteric stones usually present? Pain is the most common symptom, and may range from colicky pain in flank or groin area to chronic, non-specific flank and back pain. There may also be a history of previous renal stones, or recurrent urinary tract infections. Microscopic haematuria (blood in urine) is usually found. Complications warrant immediate relief of the obstructed system with either a DJ stent or percutaneous nephrostomy. Definitive stone treatment is planned in a stable patient according to the location & size of the calc(s), and the relevant urinary tract anatomy. What dietary advice should I follow to reduce the risk of renal stone formation? Excessive intake of salt increases the excretion of calcium. Use small amounts of salt for food preparation. Do not add extra salt to your food at the table. Avoid foods high in oxalate since most stones contain elements of oxalate. Fruit and its Juices Blackberries, black grapes, blueberries, currants, fruit cocktail, gooseberries, lemon peel, lime peel, orange peel, raspberries, rhubarb, naartjies, strawberries, juices from any of these fruit Apple, apricots, banana, grapefruit, guava, kiwi, litchi, mango, melon, paw-paw, peach, pear, pineapple, plums, green grapes, watermelon, sweet melon, avocado pear. 3. Increase your fluid intake. Try to drink a cup of water every hour. Half of your daily fluid intake should be water. Avoid tea (except rooibos tea), beer, chocolate flavoured milk and fruit juices mentioned on the diet sheet. Aim for 2-2.5 liters of urine excretion per day. Increase intake during warm summer months and physical exersize. 4. Eat small portions of meat, fish, chicken and cheese. Do not have more than 2 eggs for the week and not more than one at a time. Protein increases excretion of calcium and uric acid in the urine. 5. Increase the fibre in your diet by eating whole wheat bread and cereals. Eat more unpeeled fresh fruit and vegetables (from that which is recommended). 7. Only use calcium supplements if prescribed by a health care professional. Vitamin C supplementation should not exceed 1000 mg per day.